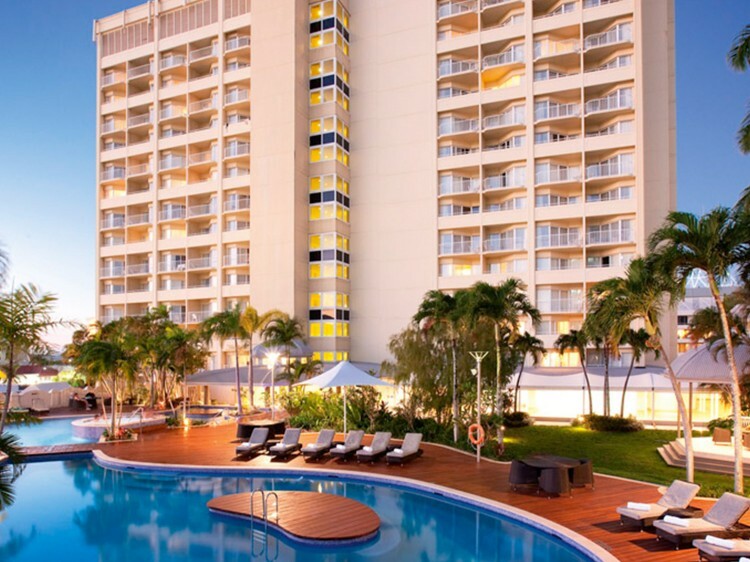 Pullman Cairns International is perfectly located in the CBD of tropical Cairns. 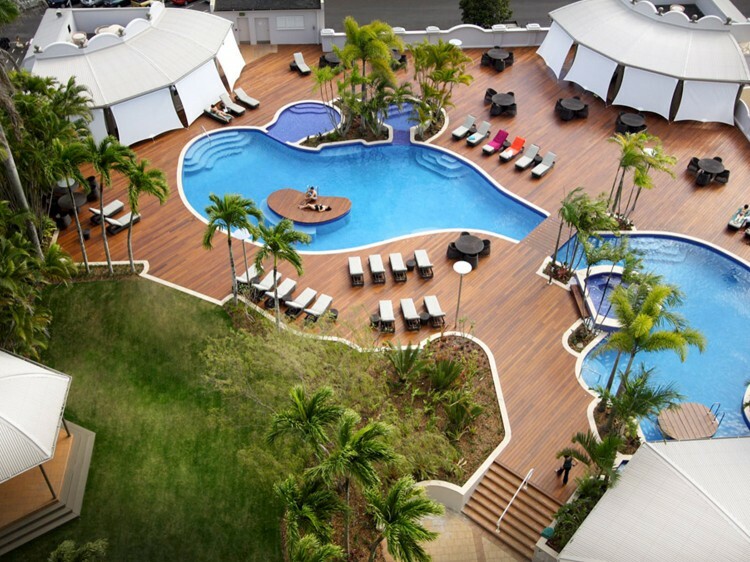 Overlooking Cairns Harbour and the lush mountain hinterland, this 321 room hotel is spectacularly positioned to take advantage of all the city has to offer. From the moment you arrive you will be greeted by the concierge service, which can assist you with your luggage, help you book transfers and tours, and offer any advice and assistance you require. Pullman Cairns International is one block from the Reef Fleet Terminal, Cairns Cruise Liner Terminal and Cairns Convention Centre. Within a few minutes’ walk is Cairns Esplanade and swimming lagoon, Pier Shopping Plaza, Cairns Central Shopping Centre and train station and an excellent selection of shops and restaurants. The gymnasium, open 24/7 for your convenience, is located on level 3 and features a full complement of cardio and weights equipment, plus water fountain, televisions and two saunas. With the latest wireless technology, Pullman Cairns International will keep you perfectly connected in room and throughout the hotel. Coco's Restaurant - located on the lobby level Coco’s is famous for nightly seafood buffet, High Tea and special occasions. Breakfast: buffet open 6.00am - 10.00am Monday to Friday, 6.00am - 10.30am weekends & public holidays or A La Carte 6.00am – 12.00pm daily. Lunch: Coco’s serves a delicious range of contemporary a-la-carte cuisine for lunch in air-conditioned comfort from 12.00pm – 3.00pm daily. Dinner: enjoy Cairns’ best seafood buffet nightly from 6.00pm featuring local produce and native Australian ingredients. A-la-carte options are also impressive, with an excellent menu featuring fresh local ingredients with a distinct contemporary flare. 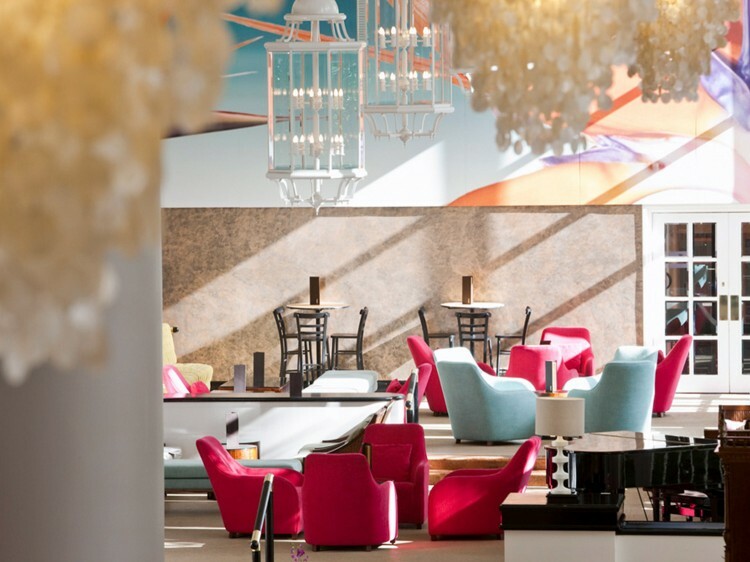 The Lobby Bar - famed for its high ceilings, three-storey high arched windows and beautiful furnishings, enjoy a delicious selection of drinks from the bar, or snacks from the bar menu. The Lobby Bar features live entertainment every Friday and Saturday night and on Sundays during Sunday Lunch. High Tea: complete with 3-tiered silver stands, Pullman has charmingly enhanced the classic offerings of scones and cream, with assorted cakes and pastries, and a selection of sandwiches. Open daily from 10:30am to 4:00pm. Cairns’ best Day Spa - a haven of tranquility and serenity for you to enjoy the perfect spa experience on your holiday. Vie Spa, winner of the 2011 Pevonia “Spa Design of the Year Award”, is located on level 2 and features 10 stunning treatment rooms, including a couple’s room, group therapy room, unique indoor/outdoor rooms and a vichy shower. Qualified therapists can help you select from a range of massage, skin therapy, facials, beauty and relaxation treatments. Relax in Vie Spa’s serene sanctuary before and after your treatment, where you will be able to clear your mind before your spa session, and enjoy a tea and sorbet afterwards. Vie Spa is open every day with extended hours for your convenience and enjoyment. Pre-booking your treatment is essential. Generously sized rooms with private balconies. Each room features in-built wardrobes, spacious bathrooms with classic Italian marble and your very own balcony to enjoy the view over the lush tropical mountains. Features stunning views over Cairns Harbour and Trinity Inlet. Built-in wardrobes and luggage storage, Italian marble bathrooms with back-heated mirrors to avoid fog., a desk with your choice of network cable or Wi-Fi internet plys a comfortable table and soft chairs by the windows is perfect for enjoying in room dining. These luxurious rooms are situated on high floors, with commanding views over the city lights and out to the mountains beyond. They feature private balconies , in-built wardrobes, spacious bathrooms featuring classic red Italian marble, a comfortable table and chairs and a work desk. Underground valet parking is available $20 per day per car (subject to change without notice).